The fear of uncertainty is an increasing factor in many people’s lives. For people living in developing countries, climate change is adding to an already complex system. In the last decade, we have seen $2.5 trillion in disaster losses. The next decade could see these trends continue and have a bigger impact as climate change leads to more uncertainty with more people living in exposed areas. Photo: South Sudan, considered a fragile state because of the conflicting groups vying for power in this, the world’s newest country. 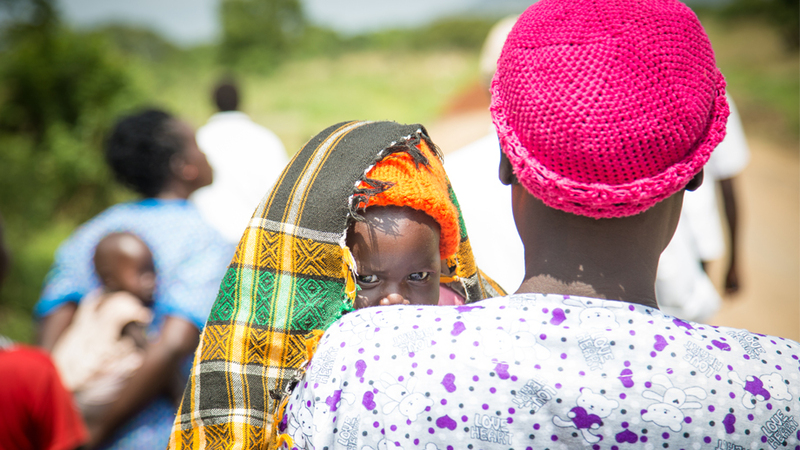 World Vision works with communities and families to enhance their ability to produce and sell food, as well as to ensure that this is done amongst all members of the community, including women, men, boys and girls. In addition more than 1.5 billion people now live in fragile states affected by conflict or in countries with very high levels of criminal violence (World Bank 2011). Violent and fragile states are a long way from achieving the millennium development goals. Together these trends make it difficult to safeguard the development gains we have already achieved with your support. Recognising that children and communities face multiple risks from natural hazards, conflict and the effects of climate change, we promote resilience in both our programming and policy advocacy. For us, resilience is defined as ‘the ability of a community to adapt to living with uncertainty’. The risks that communities in developing countries face are numerous, which is why we take a comprehensive approach to risk management. We build our work on knowledge of: root causes of vulnerability (i.e. no access to land); changing pressures (i.e. increased urbanisation); unsafe conditions (i.e. living on a flood plain) as well as the hazards that people face – be it natural (i.e. cyclone) or human made (i.e. violent conflict). Disaster risk reduction: we anticipate future risks prevent future disasters, reduce vulnerability to hazards. Climate change adaption: we help communities prepare for and adjust their systems (economic and social, for example) to changing weather patterns. Conflict sensitivity: we analyse conflict and run conflict sensitive programming to prevent unintended harm in fragile contexts. This enables us to protect children and communities experiencing conflict better, and boost resilience to cope with future conflict. Conflict analysis lets us to get a better understanding of the issues faced by communities in conflict-affected areas, helping us minimise negative impacts and maximise the positive ones. Transform risks by advocating for provision of public services and rights available to them. Currently we are working across Latin America, Asia, Africa and the Middle East and Eastern Europe to become more resilient to multiple hazards and help prevent future disasters. By working with communities in these countries, we’re able to pinpoint areas of vulnerability and the people most at risk from them. Supported by community leaders, government officials and technical experts we help affected communities become more resilient and reduce the risks they face. 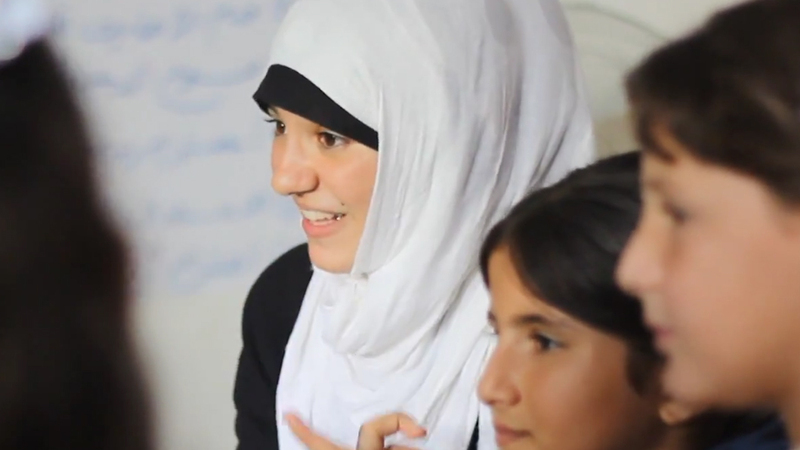 Tayma is 15 and lives in war torn Gaza. She was born deaf and is acutely aware of the dangers of not being able to hear during times of armed conflict. “In Gaza being disabled is different. As well as trying to be accepted by your community, you have to cope with the violence and protect yourself. Only a deaf person knows how it feels to see fear and panic in your family’s eyes when they hear a bomb falling, while you hear nothing. You’re not sure if something has happened, if you can get away or if you will die like many deaf children have done because they can’t hear the danger. As part of a World Vision children, adolescents and the youth resilience committee, Tayma helps other deaf children in Gaza learn how to protect themselves, stay safe and be less fearful. While working in Ethiopia we identified a significant number of vulnerable people living in urban areas at risk to various hazards. To address this, we began working on community-based disaster risk reduction projects in Merkato, a large urban market and deprived area of Addis Ababa. We held frequent meetings about children’s vulnerability to hazards and encouraged relevant city administration offices to get involved, including the Education Department, the Fire Brigade and the National Disaster Management Authority. This partnership led to recognising the importance of child centered DRR projects, which began to add risk reduction into the school curriculum. The process of integrating DRR into schools for grades one to eight was completed in September 2012, meaning that more children in both rural and urban areas will be reached through child-centred DRR. 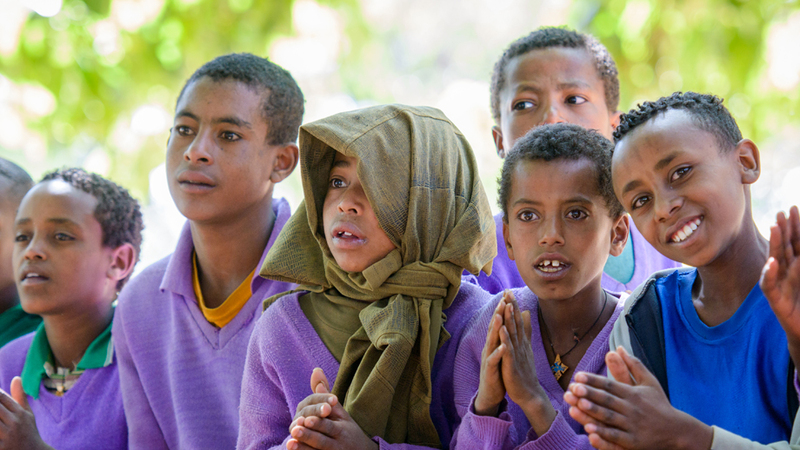 Photo: Students in Ethiopia listening to presentations about the importance of good hygiene. We recognise that climate change is real, causing more than 400,000 deaths each year. And we know it disproportionately affects the most vulnerable communities across the world; the poor and the young, threatening to undermine the progress that's been made to reduce poverty. Our aim is to protect and help those children to flourish, so we're addressing climate change as a part of our long-term work; identifying where it's already having an impact, and helping communities to adapt and to put children at the centre of these changes. The Paris Agreement is being seen as a turning point in the global effort to respond to climate change. We see an international consensus to safeguard our planet’s wellbeing and the wellbeing of future generations by limiting global warming to 1.5-2 degrees Celsius. The Paris Agreement has delivered a framework and process to significantly cut greenhouse gas emissions and support adaptation to climate change. However, gaps remain and there is still much work to be done to turn the Agreement into concrete actions. 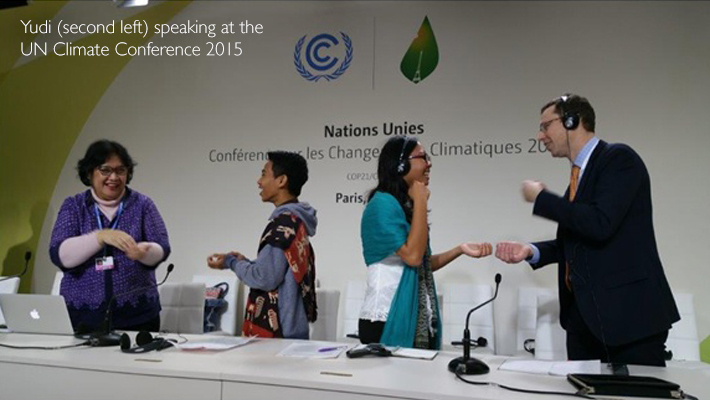 World Vision sent a delegation, including a youth from Indonesia, to Conference of Parties 21 (CoP21) in Paris. We were involved in a number of panel events and workshops, focussing on adapting to the changes that have already happened, including 'Our futures' - a youth-led discussion of real experiences, a showcase of our farmer-managed natural regeneration work, and 'Climate change and children's rights' panel where Yudi, 15, from Indonesia shared a child's perspective with decision-makers on the importance of child-centred adaptation. We also demonstrated how civil society can help support governments in tracking local level adaptation financing. The top five causes of child death are all set to get worse as climate change continues, clean water becomes scarcer and mosquito territories widen. While children are the least responsible for climate change, they're bearing the brunt of the impact. However, children are much more than passive victims – they are powerful agents of change, active at all levels. The challenge is clear: Our children’s future is at stake and our response must have children at its centre. Climate change and poverty are so deeply intertwined that for any long-term development work to be sustainable, it must consider climate change. Putting children at the centre of new resilience programmes is vital if governments wish to protect the most vulnerable. We’ve seen that whole communities benefit as the younger generation becomes more aware of risks and the actions they can take. 1) Meet the call for $100 billion USD per year by 2020, to fund climate adaptation and mitigation activities. 2) Support community contributions to local and national plans, through vulnerability and capacity assessments (VCAs). 1) Identify the unique needs and capacities of children and implement child-centred approaches to adaptation at all levels. 2) Engage children in decision-making, implementation and monitoring at local and national levels. 3) Provide children access to the global stage – and listen to them. Involve children in monitoring the implementation of climate change commitments and invite children to report on progress to future Conferences of the Parties. 4) Build a climate change and adaptation literate generation by fully implementing Article 6 of the UNFCCC - education on climate change and participation in responses - and integrating climate change and adaptation into school curricula and teacher training. 5) Focus on the most vulnerable groups and communities (including children) when determining adaptation funding allocations, and ensure these groups are meaningfully engaged in adaptation programme development. 6) Prioritise community-based adaptation to ensure that local-level actions are supported. We advocate for children and adolescents' involvement in disaster risk reduction and development. We are actively working with the United Nations International Strategy for Disaster Reduction (UNISDR) and national governments to ensure that the Sendai Framework for Disaster Risk Reduction 2015-2030 is implemented and involves children and young people. The Sendai Framework includes priority areas of action and targets to help all stakeholders work together to achieve a common outcome over the next 15 years. The new global strategy to tackle risk reduction - the Sendai Framework for Disaster Risk Reduction (DRR) (2015-2030) was approved at the Third UN World Conference on Disaster Risk Reduction (WCDRR) in Sendai, Japan. The Sendai Framework includes priority areas of action and targets to help all stakeholders work together to achieve a common outcome over the next 15 years. The substantial reduction of disaster risk and losses in lives, livelihoods and health and in the economic, physical, social, cultural and environmental assets of people, businesses, communities and countries. While the Sendai Framework was being developed we spoke with children across the globe, resulting in these: Committing to Child-Centred Disaster Risk Reduction: An Opportunity at the World Conference on Disaster Risk Reduction. World Vision child ambassadors from Indonesia and Mongolia were at Sendai and participated in the 'Don't decide my future without me' event and the Children and Youth Forum. 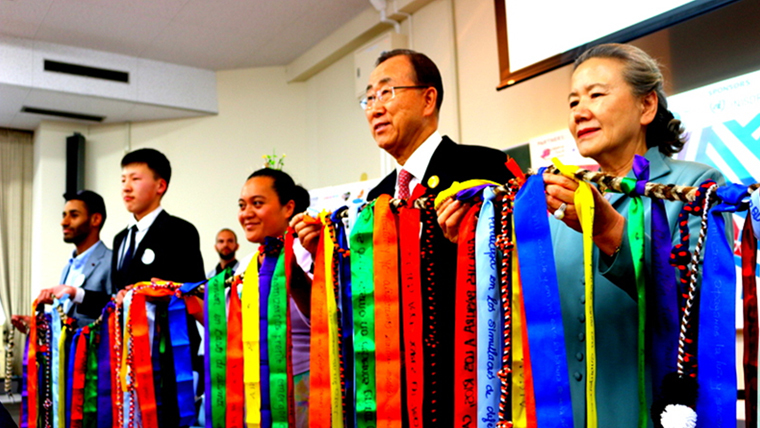 At these events, young people from around the world shared their experiences of preparing for natural and manmade hazards and called for decision makers to commit to child-centred Disaster Risk Reduction, and specifically to the Comprehensive School Safety Framework. We've also contributed to a child-friendly version of the Sendai Framework, helping children and youth to know what their governments have committed to and to be part of ensuring that their communities are safe and resilient. The Sendai Framework for DRR provides an opportunity to ensure that root causes are addressed, including the destruction of the environment. But it does fall short of some of our hopes: reaching the most vulnerable; building life skills for children and youth; and providing a robust accountability framework. In partnership with other child-focused agencies we've developed a child-centred disaster risk reduction implementation guide for decision makers to use with communities.